I am reading what might be one of my favorite books ever. 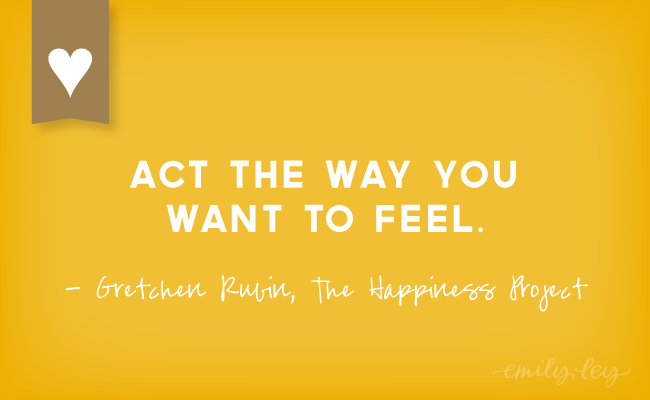 The Happiness Project, by Gretchen Rubin is a remarkable book. I love the full title: The Happiness Project Or Why I Spent a Year Trying to Sing in the Morning, Clean My Closets, Fight Right, Read Aristotle, and Generally Have More Fun. I’d heard about this during last year’s Making Things Happen tour. Someone mentioned that the book had a lasting affect on them. And well, who doesn’t want to be happier. I always want to be more organized, a better cook, a more “present” person, etc etc etc but I haven’t really thought about being happier in general. In the big scheme of things, I’ve got it pretty awesome: I’m married to my high school crush, I’m a mama to the cutest little boy ever and I work from home doing work that I love. But sometimes I take all of that for granted and I complain. I throw in the towel and get frustrated that I have to manage Brady and work all at once. I get annoyed with Bryan because he leaves his shoes scattered across the living room every night after his run. I sigh at my full inbox. And I don’t want to. I know, in my gut, how blessed I am. I just want to know it every minute of the day. I want to feel that genuine gratitude as much as possible and teach Brady the same. I want to love, give, serve more. So I am reading The Happiness Project. Gretchen Rubin was a clerk for Justice Sandra Day O’Connor when she realized her life’s purpose was to be a writer. She decided to take a year of her life and devote it to The Happiness Project – a quest to be happier and more “present” every day. More updates as I get through this book. It really is worth checking out. PS: Speaking of happiness, apply for the Making Things Happen Scholarship before its too late! Contest ends tonight! PPS: Right now, Brady is singing (well, it sounds like “da da daaa daaa” and “uh oh uh oh uh oh”) the Veggie Tales version of Back Street Boys. Where is my video camera.